Location information is of increasing importance for the execution of governmental tasks. Most of the information that is used by government has a spatial component. Like other types of governmental information, location-based information can be collected, managed, used, and exchanged with support of new information and communication technologies (ICT). In past years, governments have implemented many initiatives to promote and facilitate the use and exchange of location information. In many cases these initiatives are situated outside the e-government area. However, many authors and practitioners have stressed the need for the integration of location information activities within e-government. In order to bridge the gap between location information activities and e-government, several governments have developed and implemented a location information strategy. The objective of this chapter is to explore how the development of location information strategies contributes to a better integration of location information in e-government. 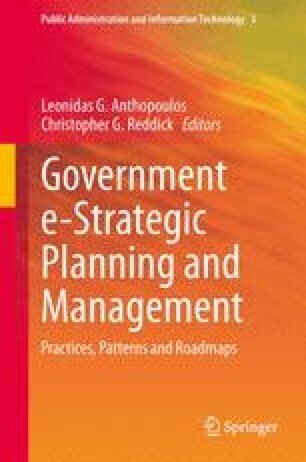 An analysis of four European location information strategies shows that these strategies have two elements in common: they all highlight the significance of location information for realizing the objectives of e-government and define requirements and actions for a better understanding and wider use of location information. A better integration of location information in e-government provides benefits to governments, citizens, and businesses. Key actions for realizing these benefits are improving the access to location information, establishing core reference data, and providing society with the skills and knowledge necessary for handling location information.